Where sugar cane grows a canefire is known for its dynamism and intensity, sweeping all before it to prepare the fields for future growth. So it is with Toronto’s CaneFire — dynamic, intense and fertile — creating a new music fashioned out of a myriad of Caribbean traditions, jazz, and the original vision of bandleader, founder, pianist and composer – Jeremy Ledbetter. 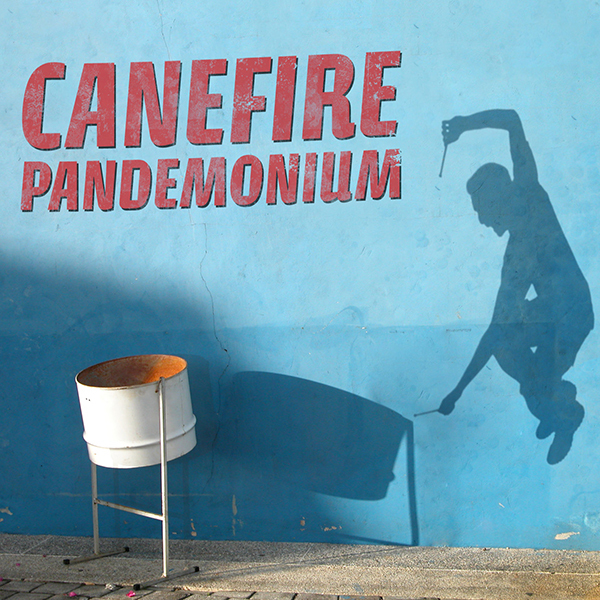 CaneFire’s signature sound revolves around its unconventional use of the steelpan — Trinidad’s contribution to the world’s array of instruments, and the only petroleum byproduct that is actually good for you. Under the hands of virtuoso Mark Mosca, the pan plays a leading role in CaneFire, taking its place alongside the horns at the front of a latin jazz combo. Caribbean-flavoured Latin jazz (or is it Latin-flavoured Caribbean jazz?) is what the septet specialize in and they do it with fire and versatility. Their unique sound blends the Latin and African folk traditions of the Caribbean with Trinidadian carnival and not so straight ahead jazz. French Caribbean ‘zouk’, Puerto Rican plena, Brazilian samba and a variety of Cuban rhythms from ‘songo’ to ‘chachalokefun’, jazz, blues and all of it smothered in Trinidadian calypso and steel band. The tunes are an intriguing mixture of influences from everywhere and the solos draw on the deep roots of the players, with the steelpan always bringing it all home. The band members hail from Canada, Cuba and Trinidad, and their accumulated training and performance credits are as impressive as they are diverse, from Percy Sledge to the Winnipeg Symphony Orchestra. CaneFire was formed in 2005 by Ledbetter, who had cut his chops as musical director for Trinidadian calypso legend David Rudder. 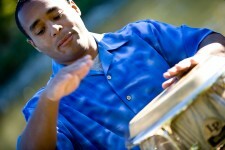 Jeremy wanted to shatter the stereotypes associated with Caribbean music and particularly the steelpan. Here this often-abused instrument is rescued from the sins of a thousand “island music” caricatures and plays its leading role with pride and integrity. In recent years CaneFire has taken their unique brand of Caribbean Latin Jazz from Newfoundland to the Yukon, to South America and the Caribbean. They have released two albums of original music, both of which have garnered rave reviews and seen time on radio charts in Canada and abroad. In 2010 the band released their sophomore album, Pandemonium. The follow-up to their 2005 debut, Kaiso Blue, it embodies all the sizzle and twice the sophistication of its predecessor, as Canadian pianist/composer Jeremy Ledbetter leads an all-star cast through more of the hard-hitting, explosive Caribbean jazz that CaneFire has become known for. Pandemonium opens with “The Madman’s Jig,” an outrageously energetic Latin jazz piece written in 27/4 time. But in terms of pure unbridled energy, there is hardly anything out there to rival “Baptism by Fire,” CaneFire’s take on a hybrid Trinidadian church music called “gospelypso”. The album includes some New York-style latin jazz (“Nothing by Mouth”), a touch of reggae (“Two Cousins”), and a meeting of calypso and be-bop on “Donna Lee (Goes South)”. Three pieces are inspired by the birth of Ledbetter’s daughter Leila, to whom Pandemonium is dedicated: “Welcome Home,” a gentle ballad that combines Afro-Brazilian rhythm with Trinidad steelband; the playful “Little Bell”; and the bonus track, “If I Could Sing,” an astonishing singing debut by then five-month-old Leila. A final song of note is the distinctly CaneFire cover of “Trini to the Bone,” Trinidad’s unofficial national anthem, voiced by none other than David Rudder, the soca superstar behind the original. Originally trained as a classical pianist in his hometown of Kitchener, Ontario, Jeremy Ledbetter studied jazz in Toronto until a violent allergy to cold weather led him to relocate to the sunnier climes of Trinidad and Tobago in 1999. Ledbetter spent several years in Trinidad studying and performing Caribbean music, eventually landing a job as musical director for calypso legend David Rudder. 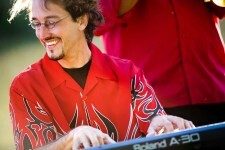 Ledbetter’s meandering route back to Canada included extended stays in Cuba, Nicaragua, Venezuela and Brazil, and provided the inspiration for CaneFire, the band he formed in 2005 to play his original compositions. A graduate of both the Royal Conservatory and the Humber College jazz program, Mark Mosca has established himself as one of the world’s leading exponents of his instrument, the steelpan. He has won the respect of peers such as Robert Greenidge and Andy Narell for his combination of virtuoso technique and improvisational mastery. Born and raised in Havana, Cuba, Alexis Baró plays the trumpet with all the force of a Category 5 hurricane. 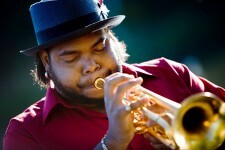 Alexis’ jaw-dropping work in Canada with groups such as Kollage, the A-Team, and the Hilario Duran Big Band has earned him several National Jazz Award nominations for “Trumpeter of the Year”. He has also released three albums under his own name. Recently returned to his hometown Toronto from an extended stay overseas, Braxton Hicks is an exciting and flamboyant woodwind player and bandleader who is proficient in a wide range of styles and genres. 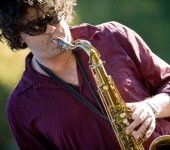 Besides his main axe, the tenor, Hicks also plays alto and baritone saxophones and flute on Pandemonium. 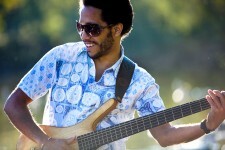 Yoser Rodríguez has been Toronto’s premier salsa bassist since moving here from his native Cuba in 2003. Originally trained as a classical guitarist, Yoser is a versatile, communicative performer who is proficient on electric, upright, and baby basses. He has also worked with crossover artists such as Andy Narell, Alex Cuba, and Odessa-Havana. Working with Jesse Cook, Amanda Martinez, Sultans of String, CaneFire, and others makes for a very busy schedule. Add a teaching position at Humber College to that and you can see what makes Cuban drummer/percussionist Chendy León one of the most in-demand Latin musicians in Canada. His work with CaneFire showcases his innovative approach to Caribbean rhythms. Rounding out the Cuban contingent is flamethrowing conguero Alberto Suárez. Hailing from Matanzas, Cuba, Alberto honed his chops with a variety of salsa and Latin jazz groups in Cuba and Canada and has now expanded his expertise to include Trinidadian and Brazilian percussion. Alberto specializes on the congas, but the djembe, atabaque, and batá also form part of his arsenal.